Home > Aries → Aries Deionizer Filter Cartridge 10"
Aries Deionizer Filter Cartridge 10"
Aries Deionizer Filter Cartridge by Aries FilterWorks is a 2.5" x 10" Clear Cartridge for deionization process. Manufactured using high quality ResinTech mixed bed resin media, this filter can reduce ions in water that come from sodium, calcium, iron and copper producing water that is similar to distilled which can be used in a variety of applications, including science laboratories. Deionization, also referred as demineralization, is the process used for removal of all dissolved salts from water. Deionizers (DI) remove both cations and anions, releasing hydrogen ions (H+) in exchange for the former, and hydroxyl ions (OH-) for the latter. The hydrogen and hydroxyl ions subsequently combine to form pure water. Deionizing Water Filter AF104010 fits most standard 2.5 inch x 10 inch filter housings and can be used in slow flow applications where distilled quality water is desired such as in labs, pharmaceutical and manufacturing process. Aside from the standard characteristic of demineralization, resin options include low odor(for humidification), and low TOC(for sensitivity to organics). These cartridges are ideal for processes requiring high purity water for washing, rinsing, scale control, or “final polishing”. *Through-put based upon operating capacity. Specific Feed conatminants can affect capacity. **Effluent based upon operating flow rate and 200 ppm feed. Specific feed contaminants can effect effluent water quality. 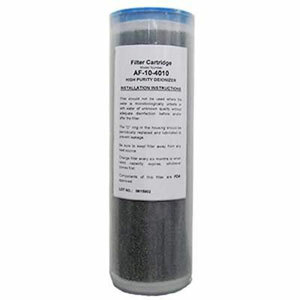 - This product is part of the AF series cartridges from Aries FilterWorks. - As a division of ResinTech, Aries Filterworks applies the technology and knowledge of ion exchange in each cartridge. - Strict quality control over all aspects of cartridge production allows complete traceability of every cartridge. Water Filter Housing, White 2.5"x10"
Aries GAC/KDF Filter Cartridge 10"
Aries Fluoride Reduction Filter Cartridge 10"